"The flag is a fur-trade era flag carried by employees of the American Fur Co. 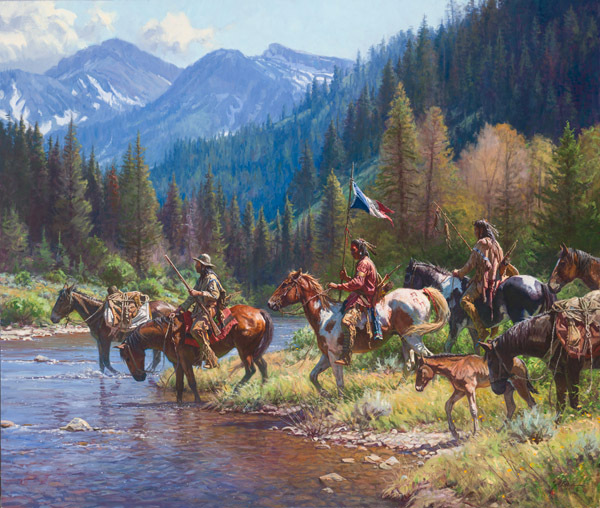 The Blackfeet have the flag, but have also acquired the hat (typical of the fur trade), a trade gun, a small red trade blanket, a mule (with it's pack), a packhorse (with it's pack AND it's colt) ... And quite likely a couple of the horses they're riding as well, or at least some bridles. Maybe they traded for these things, maybe not... Odds probably favor "not"."